Noninfectious mixed cryoglobulinemic GN (MCGN) has been poorly investigated. We analyzed presentation and outcome of 80 patients with biopsy-proven MCGN, which were identified in the retrospective French CryoVas survey. MCGN was related to primary Sjögren's syndrome in 22.5% of patients and to lymphoproliferative disorders in 28.7% of patients, and was defined as essential in 48.8% of patients. At presentation, hematuria, proteinuria ≥1 g/d, hypertension, and renal failure were observed in 97.4%, 84.8%, 85.3%, and 82.3% of cases, respectively. Mean±eGFR was 39.5±20.4 ml/min per 1.73 m2. Membranoproliferative GN was the predominant histologic pattern, observed in 89.6% of cases. Renal interstitium inflammatory infiltrates were observed in 50% of cases. First-line treatment consisted of steroids alone (27.6%) or in association with rituximab (21.1%), alkylating agents (36.8%) or a combination of cyclophosphamide and rituximab (10.5%). After a mean follow-up of 49.9±45.5 months, 42.7% of patients relapsed with a renal flare in 75% of cases. At last follow-up, mean eGFR was 50.2±26.1 ml/min per 1.73 m2 with 9% of patients having reached ESRD; 59% and 50% of patients achieved complete clinical and renal remission, respectively. A rituximab+steroids regimen prevented relapses more effectively than steroids alone or a cyclophosphamide+steroids combination did, but was associated with a higher rate of early death when used as first-line therapy. Severe infections and new-onset B-cell lymphoma occurred in 29.1% and 8.9% of cases, respectively; 24% of patients died. In conclusion, noninfectious MCGN has a poor long-term outcome with severe infections as the main cause of death. Cryoglobulinemia is defined as the presence in the serum of single or mixed Ig that precipitate in the cold and redissolve on rewarming. Cryoglobulins are grouped into three types according to Brouet classification based on their immunochemical composition.1 Type I cryoglobulins are composed of a single monoclonal Ig and are usually associated with malignant lymphoproliferative disorders. Type II and type III cryoglobulins, also referred to as mixed cryoglobulinemia, are immune complexes. Type II cryoglobulins contain a monoclonal component, mostly of IgM isotype and polyclonal Ig, while type III cryoglobulins are polyclonal Ig. Both have a rheumatoid factor activity. In the early 1990s, hepatitis C virus (HCV) infection has been recognized as the main cause of mixed cryoglobulinemia, accounting for 60%–90% of the cases.2–5 During the last two decades, many series have investigated patients with HCV-related mixed cryoglobulinemic vasculitis (MCV).5–9 Renal involvement has been identified as a major risk factor of mortality and morbidity in these patients.5–9 In contrast, noninfectious MCV remains poorly studied and only small series have documented the spectrum of renal involvement in the course of this disorder. Recently, the CryoVas survey, a French nationwide retrospective study that included 242 patients with noninfectious MCV, showed that pulmonary and gastrointestinal involvement, eGFR <60 ml/min per 1.73 m2 and age >65 years were independently associated with death.10,11 In the present study, we specifically analyzed the clinical, biologic and histopathologic characteristics, and outcome of patients with biopsy-proven mixed cryoglobulinemic GN (MCGN) enrolled in the CryoVas survey. The efficacy and safety of the different therapeutic regimens used were also analyzed. In addition, clinical and renal presentation and outcome were compared with those of 34 patients with HCV-related MCGN. Eighty patients with noninfectious biopsy-proven MCGN were identified among the 242 cases of MCV included in the CryoVas survey. Twelve additional patients with abnormal renal parameters, but no kidney biopsy, were not included in the present study. Patients’ baseline characteristics are detailed in Table 1, and were compared with patients with noninfectious MCV without renal involvement (n=150). Female-to-male ratio was 5:3. The mean age at diagnosis was 62.6±14.1 years. Mixed cryoglobulinemia was secondary to primary Sjögren syndrome (pSS) alone in 18 cases (22.5%), and to hematologic malignancy in 23 cases (28.7%), including B-cell non-Hodgkin lymphoma (n=17, including marginal zone lymphoma in seven patients, low-grade B-cell non-Hodgkin lymphoma in six patients, mantle cell lymphoma in two patients, and other B-cell non-Hodgkin lymphoma in two patients), Waldenström macroglobulinemia (n=5) and multiple myeloma (n=1). Eight of the patients with hematologic malignancy also had a history of pSS. The overall frequency of pSS was 32.5%. The remaining 39 patients (48.8%) were classified as having essential mixed cryoglobulinemia. Systemic manifestations of MCV included skin lesions, peripheral neuropathy (determined on the basis of the clinical examination) and joint involvement in 71.3%, 42.5%, and 28.7% of cases, respectively. Gut involvement was observed in 11.3% of patients who presented abdominal pain related to mesenteric infarction, intestinal perforation, or intestinal bleeding. Intra-alveolar hemorrhage defining lung involvement and intracerebral hemorrhage were also present in 5% and 1.3% of cases in the setting of the vasculitis flare. Skin manifestations and peripheral neuropathy were more frequent in patients without renal involvement (87.3 versus 71.3%, P=0.01 and 56.0 versus 42.5%, P=0.05, respectively) whereas gut involvement was more frequent in patients with renal disease (11.3 versus 2.0%, P=0.01). Only 11 patients (13.8%) had an isolated renal involvement. Compared with patients without renal involvement, patients with a noninfectious MCGN more frequently had type II mixed cryoglobulinemia (97.4% versus 84.4%, P=0.01), with a monoclonal IgM κ component in 81% of cases, a monoclonal IgG κ in 9.5%, and a monoclonal IgG λ in 3.2%. Five patients (6.3%) had a biclonal component mixing either monoclonal IgM κ and IgG λ in four patients, and IgM λ and IgG λ in one patient. Almost 19% of patients had normal C4 levels at diagnosis, 40% of patients had an isolated decrease of C4 with normal C3 level, and 41.4% had a combined decrease of C4 and C3 levels. By multivariate analysis, type II mixed cryoglobulinemia and combined decrease of C3 and C4 levels were each independently associated with renal injury. Conversely, skin and peripheral nerve involvement were significantly associated with the absence of renal disease (Table 1). Sixty-one patients (76.3%) had renal involvement at the diagnosis of MCV, whereas the median delay between diagnosis and renal disease was 43 months (range 12–156), in the remaining cases. As shown in Table 2, 97.4% of patients had microscopic hematuria, 85.3% had hypertension, and 84.8% had proteinuria ≥1 g/d. Mean proteinuria level was 3.5±3 g/d and 49.4% of patients had nephrotic range proteinuria. Renal dysfunction (eGFR<60 ml/min per 1.73 m2) was observed in 82.3% of patients at the time of diagnosis, with a mean eGFR being 39.5±20.4 ml/min per 1.73 m2, and four patients (5.1%) requiring dialysis. No difference in the renal parameters at onset was observed according to the underlying etiology. Sixty-seven (83.8%) kidney biopsy samples were available for review (Table 3). Membranoproliferative GN was the predominant histologic pattern, seen in 92.5% of cases. It was characterized by mesangial hypercellularity, capillary-wall remodeling with double contours, and focal to diffuse endocapillary leukocyte infiltration (Figure 1, A and B). Intraluminal thrombi were observed in 47.8% of biopsy specimens, mostly in patients with pSS (P=0.02) (Figure 1A). Five patients (7.5%) had lesions consistent with mesangial proliferative GN, characterized by predominant mesangial hypercellularity without endocapillary proliferation and with no or mild capillary wall abnormalities (Figure 1C). Lobular accentuation of the glomerular tuft was observed in 14.9% of cases. Crescentic extracapillary proliferation was described in 13.4% of cases, involving 11.9±8.8% of glomeruli. Interstitial fibrosis and tubular atrophy were reported in 61.2% of cases but were classified as moderate-to-severe in <25% of cases. Acute tubular necrosis was seen in 31.3% but was moderate-to-severe in <10% of cases. Inflammatory renal interstitial infiltration was observed in 56.7% of cases, 42.1% of which were characterized by the presence of lymphoid nodules. Immunostaining showed the interstitial infiltrates to be predominantly composed of small normal-appearing CD3+ T lymphocytes, whereas CD20+ B lymphocytes were almost exclusively seen in the lymphoid nodules. Vascular lesions, including arteriolosclerosis, arteriosclerosis, and necrotizing arteritis were reported in 35.8%, 62.5%, and 17.9% of cases, respectively. 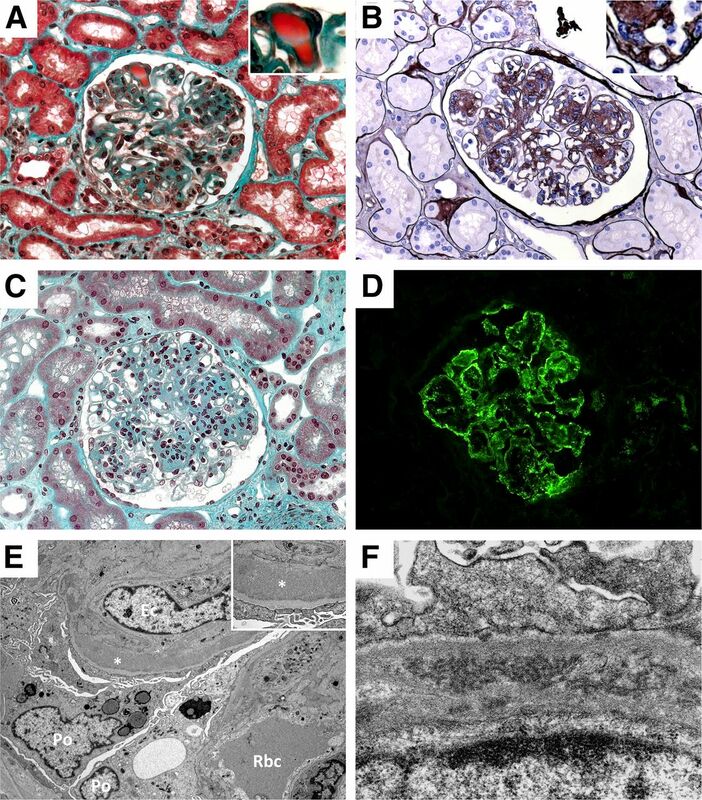 Granular immune deposits were localized by immunofluorescence in the glomerular capillary wall and less frequently in the mesangium (Figure 1D). The deposits stained mostly for IgG and IgM, and less frequently for IgA. No case showed κ or λ light-chain restriction. C3 staining was observed in all cases, whereas C1q staining was reported in more than one-third of cases. Electron microscopy analysis was performed in seven patients. Granular nonorganized subendothelial dense deposits were observed in most cases (n=5, Figure 1E). Two patients showed organized microtubular deposits in the capillary wall (Figure 1F). Glomerular lesions in the course of noninfectious MCV. Light microscopy examination showing typical MPGN with endocapillary proliferation, capillary lumen infiltration by monocytes–macrophages, and Ig-related protein thrombi in the capillary lumen (A, Masson’s trichrome stain, ×400), typical doubles contours (B, Jones’ staining, ×400) and a case of mesangial proliferative GN (C, Masson’s trichrome stain, ×400). Immunofluorescence study showing granular and immune-complex glomerular deposits composed of IgG (D). IgM, and both κ and λ light chains were also detected in a similar pattern (data not shown). Electron microscopy analysis showing capillary thickening and subendothelial granular dense deposits (E; Po, podocyte; Ec, endothelial cell; Rbc, red blood cell; *, dense deposits), and organized microtubular deposits (F). Treatments are depicted in Tables 3, 4, and 5. Four patients were not treated because of spontaneous complete or partial remission, early death, or decline of the treatment. Of the 76 treated patients, 21 (27.6%) received steroids alone as first-line therapy. Sixteen (21.1%) were treated with rituximab (RTX+steroids group), whereas 28 (36.8%) received cyclophosphamide (CYC+steroids group) as first-line therapy in association with steroids in all but one case in each group. Additionally, 10.5% of patients, mostly presenting with MCGN related to hematologic malignancy, received a combination of steroids, cyclophosphamide, and rituximab (CYC+RTX+steroids group) (Table 4). Three additional patients received steroids associated with other immunosuppressant agents. Overall, extrarenal manifestations and renal parameters at presentation were similar, irrespective of the therapeutic regimen used as first-line therapy (Table 4). At last follow-up, a total of 15.8% of patients had received steroids alone, 53.9% rituximab, and 53.9% cyclophosphamide. Rituximab was administered using a four perfusion-based schedule at 375 mg/m2 per week in all patients, whereas cyclophosphamide was administered by intravenous pulses or orally in 82.4% and 17.6% of cases, respectively. In addition, 32.9% of patients had undergone plasma exchanges, and 48.7% had received renin-angiotensin-aldosterone system blocking agents (Table 3). Baseline patient characteristics were similar between the four main therapeutic groups determined at the last follow-up, except for patients receiving steroids alone over the disease course, who were usually diagnosed as having essential mixed cryoglobulinemia (Table 5). Overall, nearly 60% of patients reached complete clinical remission and 50% complete renal remission (Table 3), whereas only 31.3% of patients showed immunologic improvement. No significant difference in the clinical response was observed between the four main first-line treatments, but the rate of complete renal remission tended to be higher in the RTX+steroids and CYC+steroids groups, compared with patients receiving steroids alone or CYC+RTX+steroids (Table 4). At last follow-up, clinical and renal responses were similar between the therapeutic regimens (Table 5). No difference was observed in term of clinical (66.7% versus 64.3%, P=0.72) and renal (66.7% versus 55.6%, P=0.89) responses when comparing oral and intravenous cyclophosphamide administration. At last follow-up, mean eGFR was 50.2±26.1 ml/min per 1.73 m2 with a significant improvement of renal function compared with presentation (P<0.001). Isolated decrease of C4 level was the only factor associated with a complete renal remission, whereas arteriolosclerosis, moderate-to-severe interstitial fibrosis, and renal interstitial infiltrates were associated with the absence of complete renal remission at last follow-up. By multivariate analysis, isolated decrease of C4 level remained associated with a complete renal remission, with moderate-to-severe interstitial fibrosis and arteriosclerosis being the two parameters associated with the lack of complete renal remission (Table 6). Seven patients (9%) reached ESRD. By univariate analysis, factors associated with ESRD at last follow-up included eGFR<30 ml/min per 1.73 m2 at diagnosis, dialysis requirement at diagnosis, and extracapillary proliferation. Nephrotic range proteinuria and intraluminal thrombi also tended to be associated with ESRD. By contrast, skin involvement was associated with a lower risk of progression toward ESRD. By multivariate Cox analysis, dialysis at diagnosis and extracapillary proliferation were the two independent factors associated with ESRD at last follow-up (Table 6). Nephrotic range proteinuria also tended to be associated with a poor renal course. After a mean follow-up of 49.9±45.5 months, 42.7% of patients relapsed with 75% having at least one renal relapse episode (Table 3). A total of 52 relapse episodes were recorded, with 21 patients presenting with one relapse, and four, five, and two patients experiencing two, three, and four relapses, respectively. Of these relapse episodes, 12 (23.1%) and 13 (25%) were isolated renal or extrarenal flares, respectively, whereas concomitant renal and extrarenal relapses occurred in 22 (42.3%). The nature of the relapse was missing in five cases (9.6%). Relapse rate was lower in patients receiving the rituximab+steroids combination, as compared with other treatment regimens (Tables 4 and 5). During follow-up, five patients (8.9%) developed new-onset hematologic malignancy, including B-cell non-Hodgkin lymphoma (n=3) and Waldenström macroglobulinemia (n=2). They all received six monthly intravenous pulses of cyclophosphamide (cumulative doses: 4.5–6 g) as the first-line therapy, followed in one patient by rituximab (375 mg/m2 per week for four perfusions), before the diagnosis of the lymphoproliferative disease (Table 5). About 29% of patients had severe infections and 24.1% of patients died compared with 12.7% of patients without renal injury (P=0.04). The mean interval between kidney biopsy and death was 23.8±45.7 months, but almost 60% of deaths occurred during the first year after the renal biopsy. Patients receiving rituximab-containing regimens as first-line therapy showed a higher rate of early death (during the first year of follow-up), whereas cumulative exposure to rituximab was not associated with an increased mortality at last follow-up (Tables 4 and 5). Severe infectious episodes only tended to be more frequent under rituximab+steroids treatments, and a non-significant increase of infections was noticed in patients treated with cyclophosphamide orally compared with those receiving the drug intravenously (50% versus 29.6%, P=0.55). Survival rates at 1, 5, and 10 years were 84.4%, 73%, and 73%, respectively. Cause of death included severe infection (47.4%) and bleeding complication (26.3%), and was undetermined in 26.3% of cases. By univariate analysis, the complement profile was the only parameter associated with death. By multivariate analysis, the combined decrease of C3 and C4 levels was the only independent baseline factor associated with death at last follow-up (hazard ratio [HR]=3.55; 95% confidence interval, 1.10 to 11.40, P=0.03). In contrast, peripheral nerve involvement at diagnosis tended to be associated with a better outcome (HR=0.41; 95% confidence interval, 0.14 to 1.16, P=0.09). We compared presentation and outcome of the 80 patients with noninfectious MCGN with a group of 34 patients presenting with HCV-related biopsy-proven MCGN (Supplemental Table 1). Mean age at presentation was not different between the two groups, but there was a higher proportion of men in the HCV-related group. At presentation, hematuria was less frequently recorded in HCV-related MCGN. Although not statistically significant, noninfectious MCGN had more frequently an eGFR<60 ml/min per 1.73 m2 or required dialysis at diagnosis, whereas proteinuria was comparable between the two groups. All kidney biopsy specimens were classified as membranoproliferative GN in HCV-infected patients. Extrarenal manifestations of MCV were similar between the two groups, except for the central nervous system involvement, which was more frequently reported in HCV-related MCV. At the last follow-up, no difference in the renal parameters was observed between the two groups. However, a lower rate of severe infections was recorded in patients with HCV-related MCGN, which were also less exposed to steroids than the noninfectious forms (Supplementary Table 1). Contrary to HCV-associated forms, noninfectious MCGN has been poorly investigated.4,5,9,10 In a French nationwide survey, we identified 80 patients with noninfectious MCGN and analyzed the renal and extrarenal presentation, prognostic factors, impact of treatments, and outcome. These characteristics were compared with a group of 34 patients with HCV-related MCGN. In two previous studies mostly analyzing HCV-related MCGN, nephrotic proteinuria and eGFR<60 ml/min were less frequently observed than in our noninfectious forms.7,9 In our study, proteinuria was almost similar between the two groups. Only hematuria and to a lesser extent eGFR< 60 ml/min or dialysis at presentation were more frequently observed in patients with noninfectious MCGN than in those with the HCV-related form. However, renal outcome was similar between the two groups, with <10% of patients reaching ESRD. Combined decrease of serum C3 and C4 levels was independently associated with mortality in our study, suggesting that a more severe course of the disease could be driven, at least in part, by a stronger amplification of the complement alternative pathway, as indicated by systemic C3 decrease. In HCV-related MCV, antiviral therapy combined with rituximab proved to be very effective, whereas the optimal therapeutic strategy has not been established yet for the noninfectious forms. However, when used as first-line therapy, rituximab+steroid combinations were impacted by a higher rate of early deaths and tended to be associated with the occurrence of severe infections. In the CryoVas survey, serious infectious episodes also most likely developed with this therapeutic association whereas mortality rate was not different compared with steroids alone.11 Reports before the era of rituximab pointed to a significant increase in infections and mortality in patients with noninfectious MCV of >60-year-old (odds ratio=1.06) and with renal involvement (odds ratio=5.2).21 Similarly, in the series of Matignon et al. only 10% of patients received rituximab whereas >25% of patients experienced serious infections, mostly patients >70 years, with an essential mixed cryoglobulinemia, and who had received high doses of steroids.12 We also observed that severe infections occurred less frequently in HCV-related MCGN compared with the noninfectious group, as previously reported.8 Interestingly, whereas exposure to rituximab was similar between the two groups, fewer than half of the HCV-infected patients received steroids. Other serious complications punctuated the course of MCGN, especially new-onset hematologic malignancy. In previous reports, risk factors of new-onset lymphoma included cryoglobulinemia level >0.6 g/L, vasculitis features and hypogammaglobulinemia.21 In our series, the role of the immunosuppressive therapy in the occurrence of the hematologic malignancies is unlikely, given the low cumulative doses of cyclophosphamide administered. The present study has limitations. The retrospective collection of data accounted for potential biases, notably in the assessment of extrarenal manifestations and the interval between systemic symptoms and renal lesions. In particular, electrophysiologic parameters were not systematically recorded in patients with suspected neuropathy and rheumatoid factor was not available for all patients. Centralized review of renal biopsies could only be performed in 67 of 80 cases. The variability in patients’ follow-up may have contributed to a potential underestimation of outcome events. In addition, comparison with the HCV-related group must be cautiously analyzed, given the shorter period of enrollment and duration of follow-up, as well as the monocentric origin of this group, and the distinct therapeutic regimens used. In conclusion, our study describes the spectrum and outcome of patients with noninfectious MCGN. The high frequency of hematologic malignancies emphasizes the need for a thorough evaluation of patients with noninfectious MCV over the disease course. Renal interstitial lesions, including inflammatory cell infiltrates and interstitial fibrosis, may impact long-term renal outcome. Patients have a poor long-term survival and complement cascade activation appears to be an independent prognostic factor of mortality. Because rituximab+steroids association might be more efficient to prevent relapses than the other therapeutic options, prospective controlled trials are required to better tailor treatment, especially reducing steroids doses, to lower the risk of severe infections and other life-threatening complications. The present work is an ancillary study to the CryoVas survey, a French nationwide retrospective study, which included 242 patients with noninfectious MCV diagnosed between January 1995 and July 2010.10 All patients had positive MC and systemic vasculitis, as previously defined.10 Exclusion criteria were the presence of positive anti-HCV and anti-HIV antibodies and hepatitis B surface antigen. Of note, cases of non HCV-related infectious forms of MCV were not included in the study. Among the 242 patients enrolled in the CryoVas survey, only patients with biopsy-proven renal disease were included in the present study, which was performed in accordance with the ethical standards of the Helsinki Declaration and approved by the institutional review board. Clinical and biologic data were recorded for each patient at diagnosis, during and at the end of follow-up.10 The cause of MC was established according to international standard criteria, including the use of the World Health Organization classification of neoplastic diseases, and the classification criteria for Sjögren syndrome.22,23 The diagnosis of “essential” MCV was retained if no alternative diagnosis could be identified, including exclusion of hematologic malignancy by bone marrow biopsy and imaging. Renal parameters included serum creatinine, urine protein and urine red blood cell count. eGFR was calculated using the four variables Modification of Diet in Renal Disease equation. Proteinuria and nephrotic range proteinuria were defined by urine protein >0.3 g/d and ≥3 g/d, respectively. Complete and partial clinical responses were defined by an improvement of all baseline clinical manifestations, and an improvement of at least half of the manifestations, respectively. All other patients were considered as nonresponders. The complete renal response was defined by a proteinuria of <0.5 g/d and the disappearance of hematuria and an improvement of eGFR of >20% if baseline eGFR was lower than 70 ml/min per 1.73 m2. Partial renal remission was defined as the improvement at least one of the renal parameters (proteinuria of <0.5 g/d, disappearance of hematuria, and/or improvement of eGFR of >20% if lower than 70 ml/min per 1.73 m2 at baseline), whereas all other patients were considered to be nonresponders. Immunologic improvement was assessed by a >50% decrease in the baseline cryoglobulin level and/or a >50% increase in the serum C4 fraction. Extrarenal relapses were defined by the reappearance of clinical signs of vasculitis confirmed when necessary by appropriate investigations, and renal relapses were defined by the decrease of eGFR and/or reappearance or increase of proteinuria and hematuria. Clinical and biologic data were collected at presentation, during and at the end of follow-up for 34 consecutive patients presenting with HCV-related MCV and a biopsy-proven MCGN seen at the Department of Internal Medicine, Pitié Salpétrière (Paris, France) between 2001 and 2008. Descriptive statistics included the mean (±SD) or median (and range) as appropriate for continuous variables, and frequency (percentage) for categorical variables. Univariate analyses were performed using the χ2 or Fisher exact test, as appropriate and the nonparametric Mann–Whitney test. Survival analyses were performed using the logistic regression and Cox proportional hazards models as appropriate. For multivariate regression models, all covariates with P <0.20 in the univariate analysis were included in the multivariate analysis. Then, a backward selection procedure was applied, and only factors associated with the considered outcome with P<0.05 were kept in the final model. Statistical analysis was performed using STATA 11.2 for Windows. The following are members of the CryoVasc Study Group-Local Investigators: Laurent Aaron, Sébastien Abad, RedouaneBakir, Pauline Belenotti, Lucas Benarous, Nathalie Beneton, Gilles Blaison, Claire Blanchard-Delaunay, Fabrice Bonnet, Pascal Cathébras, Fabrice Carrat, Laurent Chiche, Olivier Chosidow, Bernard Combe, Carole Cordonnier, Nathalie Costedoat-Chalumeau, Pierre Cougoul, Bernard Cribier, Anne Croue, Laurent Daniel, Gilles Defuentes, Dominique Desvaux, Frédérique Dijoud, Elisabeth Diot, Laurent Doucet, Jean-Paul Duong Van Huyen, Isabelle Durieu, Philippe Evon, Sophie Felix, Sophie Ferlicot, Thibault Fraisse, Camille Francès, Hélène Francois, LoikGeffray, Helder Gil, Jean Michel Goujon, Angélique Guillaudeau, Jean Gutnecht, Eric Hachulla, Olivier Hinschberger, Arnaud Hot, Noémie Jourde, Jean-Emmanuel Kahn, Jean Louis Kemmeny, Adeline Lacraz, Olivier Lambotte, Claire Larroche, Estibaliz Lazaro, Guillaume Le Guenno, Véronique Leblond, Nicolas Limal, Eric Liozon, Catherine Lok, Véronique Loustaud-Ratti, Kim Ly, Marie-Christine Machet, Hervé Maillard, Antoine Martin, Marie Matignon, Olivier Meyer, Catherine Michel, Anne Modesto-Segonds, Philippe Modiano, Dominique Nochy, David Noel, Raphaele Nove-Josserand, Céline Onno, Sandra Onuifarasoaniaina, Christian Pagnoux, Caroline Pajot, Géraldine Perceau, Antoinette Perlat, Anne-Marie Piette, Jean-François Pouget-Abadie, Thomas Quemeneur, Viviane Queyrel, Joseph Rivalan, Patricia Rullier, Luc de Saint-Martin, Elisabeth Salles-Thomasson, Françoise Sarrot-Reynauld, Thierry Schaeverbeke, Gwendoline Sebille, RaphaeleSeror, Jacques Serratrice, Alexandre Somogyi, Pascale Soria, Marie-FrancoiseThiercelin-Legrand, François Truchetet, Jean-Paul Vagneur, Bérengère Vivet, Pierre-Jean Weiller, Bernadette Woehl-Kremer, Jean-Marie Woehl, Thierry Zénone. M.Z., B.T., P.C., and E.P. contributed equally to this work. This article contains supplemental material online at http://jasn.asnjournals.org/lookup/suppl/doi:10.1681/ASN.2015020114/-/DCSupplemental.